When Bollywood wanted to get married the unrushed, spoilt luxury style, it chose Delhi Farmhouses. Remember how Band Baaja Baaraat quite glaringly captured the 'posh' side of Delhi? Anushka Sharma introduces the upscale farmhouses in Delhi with the words, “Yahaan dulha helicopter mein utarta hai. Paanch crore tak ka budget toh koi baat hi nahi." Doesn’t this pretty much set the picture in our minds when it comes to farmhouse weddings that are a part of Delhi’s culture? This warm city with lots of history and cross-cultural influences is all about having fun. These days, the farmhouse parties are scandalously lavish and full of life. We’ve compiled a list of the best farmhouses (in no particular order) to get married in Delhi. This farmhouse in Delhi for marriage subtly manages to make your dream wedding come to life. This world-class venue is professionally managed with qualified and experienced professionals from the industry. No matter what the gathering strength is, this property is spacious enough to host any wedding ceremony. With an in-house catering facility, it serves mouthwatering delicacies to guests. Amaanta Farm rightly manages to give a dose of exclusivity and personalisation. Popular for its ambiance and style, Imperial by Mallu Farm, is set amidst plush surroundings to make your wedding more than special. Situated at the heart of South Delhi, it is perfect for a once in a lifetime event. Whether you are looking at simple pre-wedding functions or an extravagant reception party, it is equipped to give you a smooth service with top-notch facilities. This farmhouse in Delhi for marriage has power back up, so you don’t have to worry about the lights going out in the middle of the functions. Offering ample parking space, it offers exclusive décor that makes any event delightfully unique. Offering a magnificent garden and enclosed banquet halls for celebrating all your wedding functions, this venue is located at the main Chattarpur Road. 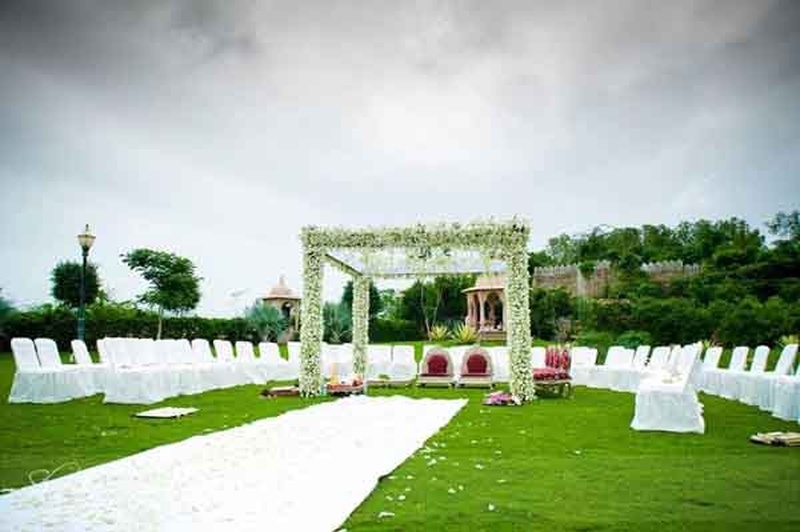 This well-known farmohouse in Delhi for marriage has a luxurious lawn and hall for wedding venues. Popular among the elite who prefer exclusive weddings away from the conventional halls, this farm in Delhi provides natural green surroundings for the nature lover in you. If you are looking at the perfect wedding escape in South Delhi, Golden Tulip will impress you with the ideal ambiance and comfort. This contemporary hotel is spread over three acres of lush green lawns and 34 well-appointed rooms and suites overlooking the pool and garden to accommodate all your guests. Conveniently located at 5 kilometeres from the Indira Gandhi International Airport, it enjoys connectivity to tourist attractions like Qutab Minar, Connaught Place and Lotus Temple. It offers a string of wedding spaces to delight the romantic and perfectionist side of you. Nestled at the prime South Delhi locality of the city, Sanskriti Greens is a top-of-the-line wedding venue with five acres of lush green surroundings. This popular wedding venue is located on a 200 ft. wide congestion-free road void of public transport, making it easy for your guests to commute. Offering five-star hospitality, it is equipped with grass pavers with the added facility of valet parking. Whether you are looking at lavish theme weddings or plain extravagance, this is the place to be. The Venetian Farm is the perfect place for a wedding with an intimate lawn to give your guests a warm welcome. Situated at Dwarka Link Road, it is spread across acres of lush green lawns coupled with indoor hall facility. Perfect for both a large gathering and an intimate one, it provides a waterproof pandal specially for dining. Equipped with ample parking space, it stands for comfort and top-notch facilities. Whether it is a large-scale wedding function or a simple affair, F&B Flora Farms offers a fresh approach to celebrations. The management ensures professionalism and is committed to delivering nothing but the best. Offering comfortable dressing rooms for the bride, it provides attention to details and quality services. One of the best farmhouses in Delhi, it has comfortable bridal dressing rooms and hygienically-maintained washrooms. Situated in the lap of nature, yet so close to the city, Anandvan Greens is a source of pure bliss and elation. It does not have any concrete buildings and structures; it is made keeping in mind human sensibilities and equipped to take your wedding celebrations to a new level. Transforming dreams into reality, it has a team that puts together the best of everything for a successful ceremony. You can arrange your mehndi, sangeet, ring ceremony and reception with complete ease here. The venue is not only visually compelling but also will make your wedding worth remembering for years. So, now that you have the perfect list for farmhouses in Delhi, book them with us for the best deals!